Deficiency in the spleen channel causing prolapse of organs including stomach, intestines and uterus. Poor digestion, distension, fatigue and lethargy, loose stools, chronic diarrhea and flatulence. 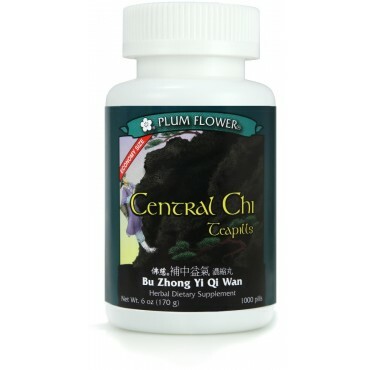 Bleeding uterus due to spleen qi deficiency, poor digestion due to chronic hepatitis or cirrhosis and certain wei patterns including myasthenia gravis and multiple sclerosis, tonic during deficiency diarrhea are some of the imbalances satisfied clients have used this product for. Astragalus membranaceus root, Glycyrrhiza uralensis root, Codonopsis pilosula root, Atractylodes macrocephala rhizome, Angelica sinensis root, Cimicifuga foetida rhizome, Bupleurum chinense root, Citrus reticulata peel, Zizyphus jujuba fruit, Zingiber officinale rhizome-fresh. - Huang qi, Gan cao, Dang shen, Bai zhu, Dang gui, Sheng ma, Chai hu, Chen pi, Da zao, Sheng jiang. Contraindicated for complaints due to excess. Contraindicated during the early stages of acute infection or illness, such as cold or flu.